Hi Everyone! Thank you for having me today, and thank you for coming. I'm thrilled to give this talk for the first time in the USA at Connect.Tech. I gave it for the first time 3 years ago. I'm still surprised by its longevity, but more than ever, we need to talk about cryptography. So, let's talk about ciphers! Before talking about cryptography itself, I must start with a little introduction. Here’s what I call the “developer responsibility”. Whether your are a developer, a designer, a software architect, you build a service that access the users’ data. Our users trust us to keep their precious information safe. Funny enough, they often don’t realize how the whole digital world is pushing to get access to this data. We produce a shitload of data every second. It belongs to us but we don’t feel concerned about how and where our apps editors store it. And guess what? Even when we’re aware of that, we can’t do anything! You can’t force your apps to use a higher security level. But, you can take security (and data encryption) into consideration when you choose an app. Most studies prove that users don’t know how to use a password. I can’t blame them for that. Seriously, do you think that I can explain to my 85’s grandmother that she needs to use a hard to remember password? And she must never ever writes it on a piece of paper. And a different password for each service? She can’t. Most people can’t. Because we have a lot of passwords with ridiculous policies that vary for each service. It’s mad! We’re mad to force our users to do that. People tell me sometimes that they don’t feel concerned. They think their service doesn’t host any sensitive data. If your service is an app like a digital library, you may think that you don’t host sensitive data. I bet that your service have an accounts system. It means that you store for each user a login, I guess their e-mail, and a password. And people don’t know how to pick up a password. They often use the same one everywhere; Even for their e-mail address. The inbox is a Graal for any hacker: if you’ve got an access to the mailbox, you’ve got an access to the reset password e-mails. You’ve got a pass to everywhere. People don’t know how to protect themselves. So you have in your service database both user’s e-mail and master passwords. If your database leaks, it’s a game over. For them first. Please don’t forget that you do have critical data, you shouldn’t ignore it. So do encryption. A lot of encryption. As much encryption as you can. You have to make peace with this idea. How many of you have already tried to work with ciphers, or understand how keys exchange works? Okay. Did you tear blood? I must tell you that I’m not a cipher expert. It requires a lot of math skills, and I’m not a mathematician. I won’t pretend I can turn you into security experts. I’d like to give you the keys I wish someone had given me back in the days. The first time I encountered encryption, I was working as a front-end developer for a startup named “Cozy Cloud.” We were working on a personal cloud. It allows you to store your whole digital life and get control back over your privacy. With this kind of product, I had to deep dive into ciphers and cryptography. Here’s the first time I tried to encrypt and decrypt a blob of data. I read the docs, cried, tried, and cried again. Cryptography isn’t authentication, security, nor revoking access or authorizations. Those things use cryptography in the back, but they are the tip of the iceberg. Cryptography is protecting sensitive information from malicious access or use. So, cryptography is only about hashing, encryption, key exchange, and signature. Nothing more. I mean, you do need to select a reliable and secured cipher algorithm. But its security doesn’t rely in its implementation secrecy. That’s the main reason why best ciphers algorithms are open source. If you only bet on the fact that your algorithm is closed source to keep it secured, you’ve got an enormous problem. Because one day or another, it will leak. Open source is the guarantee that many researchers can review the code. It ensures it to be rock-solid and not corrupted. The key in itself is the only protection. Also, the highest vulnerability too. Let’s start from the very beginning. We split cryptography into two realms. On the first hand, cryptographers; on the other hand, cryptanalysts. The former try to make data unreadable. The latter do their best to break the code and get the plain version without knowing the key. When they break it, cryptographers enforce their algorithms. Cryptanalysts will try to break it again, in an endless run. So, here’s a story for you (I love stories). I want to show you some parts cryptography in history, because digital ciphers inherit those historic parts. The first know cipher is the Caesar Cipher, or Shift Cipher. You must know it because you probably played with it when you were kids. It was at the same time you started to play with lemon juice to send invisible telegrams to your friends. It takes 2 alphabets, along a wheel. You rotate counter-clockwise the cipher alphabet around the shift parameter, let’s say 3 here. The shift param is the key. 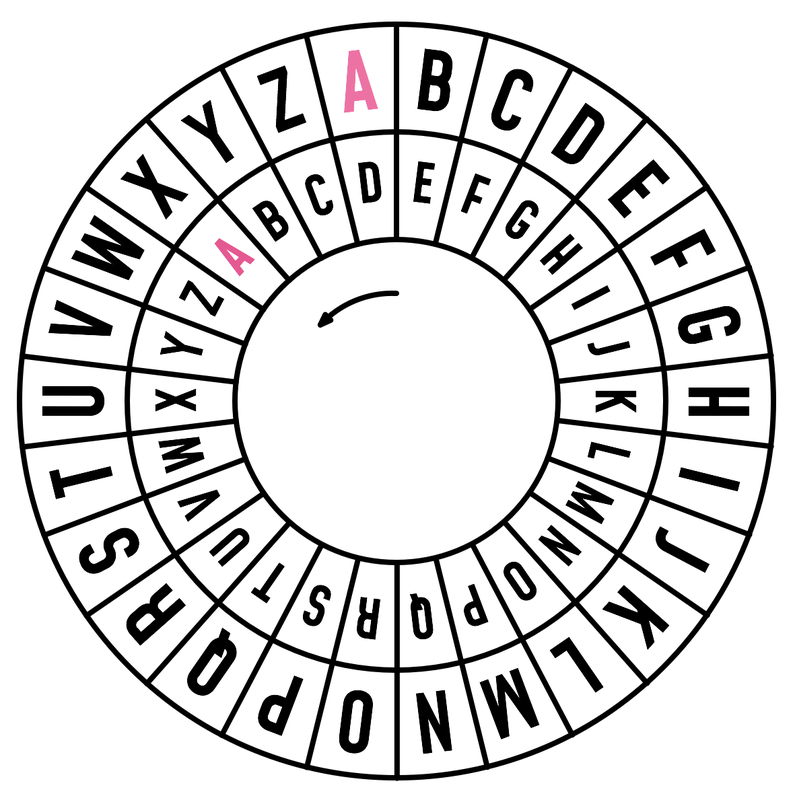 Then, you replace each letter in the plain text with the corresponding one in the cipher alphabet. So, A becomes D, B becomes E, and so on. Julius Caesar was the first known to use it in his private correspondence. It is still used in digital ciphers like ROT13. In fact, the substitution pattern is still used in most digital ciphers. The problem is the number of combinations: you only have 25 substitutions available (in the 26th one, A stays A, so we can’t consider it as… strong). It doesn’t take a long time to find the right key and decipher the text. Later, in the mid-16th century. A new kind of cipher based on the Shift Cipher appeared. “The Vigenère Cipher” is a polyalphabetic substitution. Here’s how it works: we’ve got a matrix that contains 26 shift substitutions. We pick up a key. Here, we choose the LEMON keyword. Then, we have the plain text we want to encrypt with this key. Here, it’s the ATTACK AT DAWN string. We pad the key to get the same number of characters as the string we need to encrypt. It gives LEMON LEMON LE. Then, we apply the substitution to each character. We start by encrypting the first A with the L key. Based on the matrix, we get a A. The next T, encrypted with a E gives a X. The third character, another T, encrypted with M, gives a F. And so on. Here’s the whole power of the Vigenère algorithm. The same character can become any of the 26 chars of the alphabet, depending on its encrypting char in the key. Also, a text gives a different encrypted result with a different key. The Vigenère cipher makes the Frequency Analysis unsable. Frequency Analysis is a strong cryptanalysis technic. It was first explained by Al-Kindi, an Arab polymath, in the 9th century. It uses the fact that all languages have common and rare letters. For instance, in English, E, T, A, and O are the most common letters; Z, Q, and X are the rare. Monoalphabetic ciphers preserve that pattern in the ciphertext. You can count the number of each occurrence of a letter in the encrypted content. Then you can deduce the original letter, based on its distribution across the text. Vigenère cipher broke this pattern when the same letter can have plenty of substitutes. It makes the Frequency Analysis unusable in its primary form. It took 3 centuries to cryptanalysts to break the polyalphabetic substitution. Funny enough, frequency analysis combined with other technics finally broke it. Nevertheless, digital ciphers improved this pattern by making complex substitutions. Then, back to the last century. This machine is Enigma. It’s a cipher hardware invented between the two World Wars. Its inventor, an Austrian engineer, sold it to the Reich. Germans used it during the World War II to secure radio transfer of military orders. It uses a robust, complex, and unpredictable substitution algorithm to encrypt the text. It’s known to be impossible to break. Spoiler: I’m French, and it was finally broken; otherwise I would give this talk in German. We broke it thanks to two events. The first one is that spies stole the plan of the machine. It allowed UK engineers to understand how it worked, and try to find a way to decipher its production. The second one is Alan Turing. During War, Majesty Secret Service enrolled scientists to help to decipher transmissions. Turing was one of them. He imagined the first electromechanical computer: The Bombe. It automated the decryption of intercepted transmissions. Also, it used… frequency analysis! Here’s what happened. Engima Operators needed to choose a different key for each transmission. When you’re under the bombs, in frontline of operations, stressed, you can’t find each time a new passphrase. This is what happened to the Germans. They tended to use the same passphrase, called cillies; Which lead to repetitions. 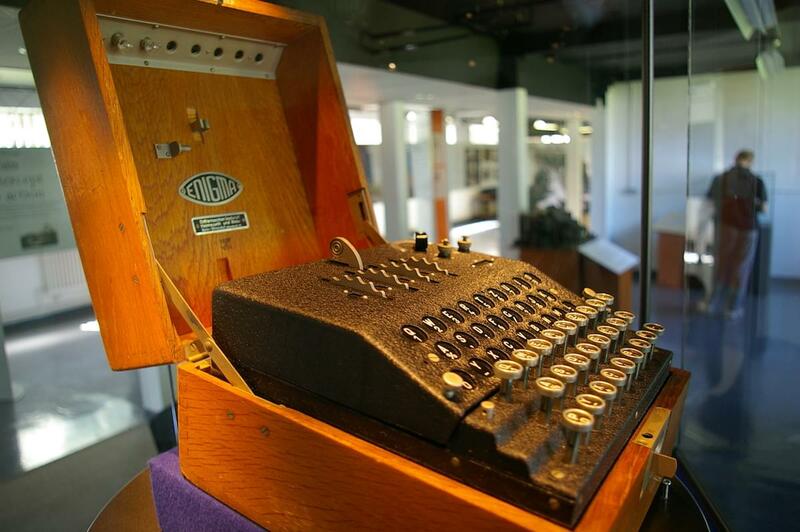 Turing’s Bombe applied statistic principles on large amount of ciphertexts. They detected cillies, and finally broke the codes. Another fail for the CKI. The only version of Enigma we couldn’t break even using the Bombe was the Navy one. They used an advanced version of their military communication protocol, with codebooks. Each codebook expired in a month and contained a different key and settings for each day. The German Navy secured protocol was too high to allowed Bombes to decipher texts. We broke them once. UK navy chooses to sink an SS submarine, enter in it during its sinking, and save a codebook. It allowed Secret Service to decipher transmissions in real time for several days. I call this a Brute Force Attack. Period. There is no pattern strong enough to resist an endless attack. Many researchers and military experts early understood the need of a single token for each operation. It avoids both repetitions and brute force risks. This principle is impossible to apply in everyday use, in a physical world. It implies to send or compute this single token for each encrypted message. I said that cryptography is about encryption, and potentially decryption. Let’s start with the basics: hashing. Hashing is data obfuscation. It’s a one-way trip that encrypts your data preventing from getting your plain data back. Because of its inability to decrypt a ciphertext, we often use the term of checksum control. A plain text that passes through a given hashing function, always output the same result. It’s a pretty good way to ensure your data wasn’t corrupted because a single bit modified in the plain text will output an entirely different result. You know some hashing functions, like md5 or sha1. It seems to be a best practice to protect the passwords. You never store your users’ passwords in a plain format. You must encrypt them. You never need to decrypt them. When your user wants to authenticate, you use the same hashing function and compare the output to the one stored in the database at sign up. Problem is: even if hashing functions are impossible to revert, we know what a plaintext version and its checksum are. That’s what we call rainbow, lookup, reverse-lookup, etc. tables. They are big tables, available on many websites, that allow you to check for a checksum and get its plaintext version. For instance, rainbow tables are for the md5 function. So it’s not secured just to store the checksum. We must make the game more complicated to defeat. We need what we call salting. We add to the hashing function a salt, a little element, unique and randomly generated. It adds noise to the hashing result. It’s an entropic factor that ensures your result, for a given password, never be the same. It deprecates rainbow tables, because the checksum won’t match any plain password. It also avoids the common factor, which deprecates analysis. Even when users pick up the same password, their cheksums are differents. It implies that a salt must be unique per password. When I look up for salting technics, I often find things like this. Those lines come from developers’ social networks like Stack Overflow. So please, never, ever do that. It’s pretty easy to break chained methods like this, especially when your codebase is open source. The right way to do with password hashing is this one. First, you create a long random number using a CSPRNG. Next, you apply a secured derivation on a concatenated string of the password and the salt. What’s important here is to use a CPU intensive algorithm. The most secured yet is Argon2. CPU intensive means it takes a long time to compute the hash; Which is good here, because even if it adds 350ms extra time, this is nothing for your user, but not for a brute-force attack. It’s like fire-proof doors. They’re not here to stop the fire, but to slow its progression. Then you store all elements as a record in your database: your hashing function, the round number used to initialize it, then the string of the hash and the salt. When you want to check a password validity, you reuse the same hash func with its round param, and the salt, which is easy to retrieve because the hash has a fixed length. It ensures compatibility for your users if you need to upgrade your hash func later. Finally, to prevent SQL injection that may try to replace a hash record in your database, sign the payload with an HMAC function using a key that you keep securely in your filesystem. Or use an HSM to do that. This way, nobody without the key can inject a signed hash record in your database. It keeps your password payload safe. If you need more details about this process, read the Crackstation’s blog post here. If you do that, the risks are low, both in case of brute force hacking and in case of database leak. Well, hashing is great, but you may need to decipher your data. We distinguish two kinds of encryption algorithms. 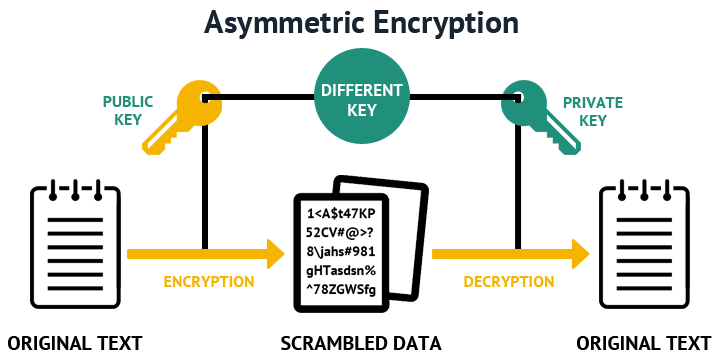 Those that use a single key to both encrypt and decrypt – the symmetric ciphers. And those that use a pair of different keys: one for encryption, and one for decryption. They are the asymmetric ciphers. First, the block ciphers. Symmetric ciphers substitute elements in your data blob. Exactly like what we’ve done with the Shift Cipher or the Vigenère Table. Block Ciphers take a data block, and do a shift on it. Then often use more complex variables, where they also do permutations between blocks. They use a fixed length key, and pad it (like we did with the LEMON key) to adapt it to the length of the data blob to encrypt. You will encounter the DES algorithm a lot. It’s the real first one digital cipher algorithm released. It has been deprecated for a while now. Its next generation is AES, even if it tends to be weak right now. Other well-known options are IDEA or BlowFish. There are many alternatives available; it depends what and how you need to encrypt data. Stream Ciphers encrypt an uninterrupted flow of data. They don’t need to first know the length of the data blob to encrypt. They use a key generated with a CSPRNG. They apply substitutions based on it. Stream ciphers allow varying block that resynchronize and adapt themselves on the fly. Unfortunately, to keep the system secured, you need to generate a cipherkey as long as data flows. Your cipherkey will grow extensively and overflow your memory at a given point. To avoid that, we often reuse the key in a padding pattern; Which introduces repetitions. Repetitions are bad. Really, really bad. RC4 was one of the first stream cipher algorithms and was used in WPA to protect WiFi connections. Due to its setup process and key repetition, attackers may deduce the key and decipher the WPA data flow. RC4 is deprecated, and WPA finally came back to AES. You can find stream ciphers alternatives like ChaCha20 or Panama. But they’re not reviewed enough to be considered as safe. One potential candidate to strong stream ciphers is quantum computers. Right now, we are still trying to understand what quantum means, so, let’s say it’s not for tomorrow. One big issue with computer is finally pretty simple. Thanks to their processors design, they tend to reproduce patterns. Even when they try to generate random things. Using devices that measure temperature, hygrometry variations, you can get true randomness. But they cost a lot. So, to avoid the risk of repetitions, we tried to patch the false-randomness of our computers. To keep ciphers algorithms semantically secured, we need to introduce entropy. We use a CSPRNG function that produces a unique random number. Block ciphers uses it as first input. A block cipher often substitute a block by using a derivation where the last block in the chain takes part. When you run your block cipher on a nonce before encrypting your data, you put the algorithm in a unique state. This nonce serves as an Initialization Vector. Ciphers can run in several block modes of operation. A block cipher algorithm only encode… a block! If your data is larger than a block, you need to repeat to cipher block and iterate. The mode of operation defines how to apply this repetition (bad, bad thing, repetition), and keep them secure enough. ECB and CBC are the most common ones, but they are now easy to break. We now rely on double pass modes of operation that both encrypt and confirm data integrity. They form the AEAD group. Most common and secure is the EAX mode. Please use AEAD modes as often as you can. I spent some time to speak about symmetric algorithms and their modes. They present a huge weakness. You need the same key to both encrypt and decrypt content. It means you need to transfer it to your recipient in case of communication. A transfer means it can be intercepted. So we need another way to deal with encryption. The solution is named Public-Key cryptography, or Asymmetric key cryptography. Here, we use not one, but two keys. Those keys work in pairs. A pair combines a private key, which is private – it’s in your pocket, you never show it to anyone – and public key, which is… public, indeed. Here’s how it works. I keep the private key (in my pocket), and distribute my public key for free. Then Bob wants to send me a message. To do it, he encrypts it using my public key (which is publicly available, on my website, my vcard, a registry…). I, Alice… Well, I receive the message. I can decrypt it using my private key. That key is the only one that can decipher it because it’s the one associated to the public key used by Bob. Because I’m its only owner, I’m the only one that can decipher the message. Public-key algorithms rely on the intractability of certain math problems. RSA uses the complexity to factor prime numbers to verify the key-pair association. Eliptic Curves use the infeasibility of finding the discrete logarithm of a random eliptic curve. They are both strong enough to protect communications. Advantage comes to Eliptic Curves as the problem to solve is harder than the RSA one. It means you can use smaller keys with EC for the same level of protection. However, they’re both sensible to the Shor’s algorithm. It is dedicated to run on quantum computers, and be able to solve both. So their protection isn’t enough for long-term documents protection. You have to prepare to upgrade your cipher strategy, because they will fail one day. So, we know how to encrypt data too. It’s time to deal with the rest of cryptography: key exchange, certificates, signatures. All those things that allow us to trust our data. The fastest and simpler algorithms used are symmetric ciphers. But because the key need to be transferred, it’s difficult to maintain its security. Researchers early found that a system able to use two keys for operations is more robust. Unfortunately, it’s way more difficult to design than explain. During their journey to find a valid public-key cipher, Diffie and Hellman found an alternative. Here’s how this key exchange pattern works. Using a common public secret, they both can generate the same key on their side and use it as a symmetric key. Diffie and Hellman were early aware that their pattern presents some leaks. You need to exchange parts that implies your private key. So, it can be retro-engineered at a given time. It can’t be a strong enough solution for long-term exchanges. But, for short-term communications, it’s enough. That’s why it’s used in TLS communications (the s in HTTPs). 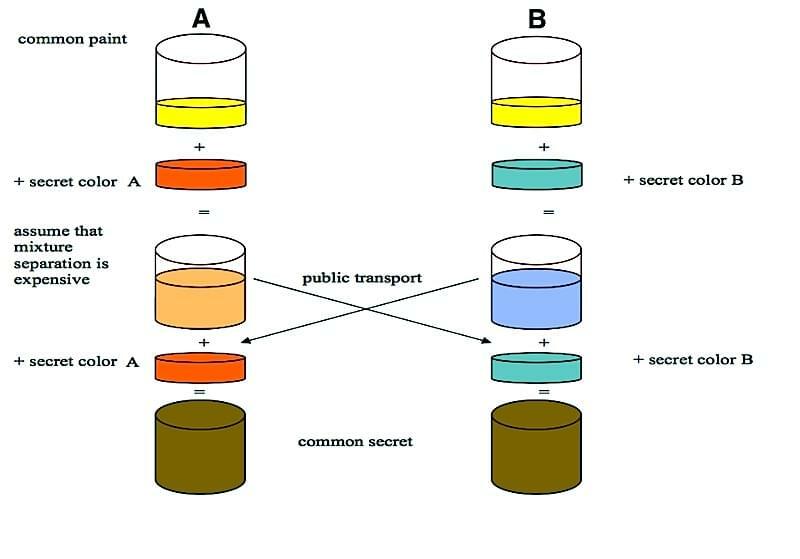 Server and Client generate random secret keys, share a common secret, and generate the symmetric key that will protect a single request-response HTTP transfer. At each new request, the whole process is replayed. A bottleneck with asymmetric ciphers is their CPU time to perform encryption. It takes a loooooong time, which isn’t acceptable when doing day-to-day operations. 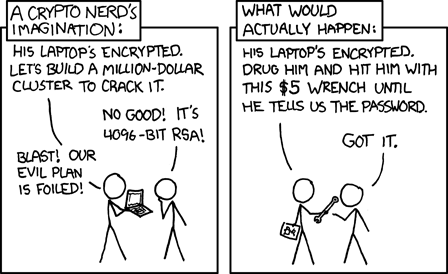 So, it’s more powerful to encrypt a message with a random symmetric key. Then we encrypt this key with the asymmetric public key, which is fast because a key is always tiny. We pack both, send it, and do the opposite operation to decrypt the message. This key-exchange pattern is called key wrapping. It takes both of the two worlds, including randomness and fast operations. It’s the principle behind PGP, which was a promise of cryptography for everyone. Which worked well because everybody uses it nowadays. Yeah, I know. It’s one of the big fails of PGP and encryption. It proves that it stays too complicated for people to handle it easily. Use it, really. It’s dead simple after all. A side effect of asymmetric ciphers is that you can also encrypt with your private key and decrypt with the public one. It’s useless for security purposes because your public key is public. Everybody could decipher your message, so it protects nothing. But, if you’re able to decipher using a public key, it means that it was encrypted using the associated private key. And you’re its only owner. So if a message comes, encrypted with your private key, no-one but you can have sent it. This pattern is called signature. It’s a straightforward way to ensure your message comes from an identified entity. My mother prefer to do it by phone. I recently sent her an e-mail asking for old photos of me, to send to a colleague she doesn’t know. She called to ask me if I was the original sender of the mail before leaking some compromising contents. I guess I definitely need to explain PGP to my mom, because I signed the mail. Problem is: how to ensure that the public key you get belongs to your recipient? For people, we have Signin Parties. You physically encounter people and sign their public key with your private key. It builds a chain of trust that allows you to trust the final public key. However, for bigger entities, you can’t encounter them physically. So we build a certificates authorities system, that builds a pyramidal chain of trust. Services exposes a certificate used to sign their public keys. A trusted authority delivers this certificate, signed by its private key. It can be an intermediate authority certified by another top authority, and so-on. Let’s Encrypt is a project that delivers free of charge that kind of certificates. It allows everyone to certify the public key used by its service. The advantage is that you can revocate a certificate at any time. It immediately invalidate the associated public key, in case of failure. The main inconvenient is that it’s a centralized chain of trust. We saw this limit 2 years ago. Symantec, which is a top-level authority, bought Blue Coat, a company that sells DPI systems. Certificates involved in their tools became the property of Symantec. They said they are separated, and there is nothing to be affraid of. But we saw many revocations of certificates in the whole chain of trust. The purpose of cryptography is to protect. Data? Do key-wrapping and asymmetric encryption, with HSM devices when you can. Let’s talk a bit about how to use cryptography, especially in modern architectures. If you’re working in a low-level environment, you can rely on your operating system modules. You can also use low-level libraries, like OpenSSL. For embedded software you can use processor set of instructions, like Intel’s AES-NI. Or use a co-processor dedicated to cryptographic tasks. Even so, it’s a hard job that requires many security skills. For advanced scripting languages, there’s a wide list of extensions dedicated to cryptography. They contain everything you need to hash, encrypt, decrypt, randomly generate, sign, etc. Use them. Always. In the browser, there is a spec, produced by the W3C WebCrypto Woking Group. I know the group’s chairwoman, and when she told me they are working on a spec, I was pretty happy. Then I read the spec. It is the most obscure, unsable spec produced by the W3C. It’s a paper from researchers and security experts, for cryptographers. If you’re not involved in cryptography, you must give it up. Nevertheless, it’s an official spec since Jan. 2017, even if the group was dissolved then. The API exposes a root namespace, crypto, which exposes a subtle subnamespace. Probably because it’s too subtle to be used by Beotians. Joking. That’s because Microsoft tried some crypto implementations in this namespace back in the days. And you know. We, as web developers, are the only ones that ship code compatible with more than 25 years old interpreter. The hard trick is that all functions exposed by the WebCrypto API use promises, and binaries. So you have to convert a lot of data from and to their binary form to manipulate them. I don’t say it’s impossible, but it’s far than a simple thing. The spec officially supports a lot of modern ciphers. Unfortunately, no one is mandatory. Browsers editors choose which one to include in their browser. You have to test each one to know if it is supported or not. Do you remember can play type? The HTML media element has a can play type function, allowing you to ask if the browser supports your media format. This function can return a boolean (true/false); or maybe; or probably. Funny, right? That’s when your browser can’t read the media by itself but can expect the OS can do it directly. Same thing here: no guarantee your browser supports your cipher. So it’s a low-level API. When I gave this talk three years ago, I said: “I hope we will see high-level API coming soon, like a JQuery for crypto.” Here it is! There are now many JS libs based on WebCrypto, that allow you to manipulate ciphers in the browser. You can find a curated list of them in this gist. So, time to conclude (because the coffee is cooling right now). What do we do? First: never ever play the sorcerer’s apprentice. Cryptography is a hard job, dedicated to maths. It requires many skills that most people can’t pretend to have, myself included. Don’t try to reinvent the wheel. Be confident to crypto-developers, and use their open source work. Second: never forget that security has an inverse relation to simplicity. The more you increase your security, the more it will be complicated to use to your users. It means security come at a cost. In time, in UX, in money. You have to adjust the cursor between all those params. This guy said that he lived in the USA for studies. He’s gay and used Ashley Madison platform to meet people. Now, he’s returned in its country, Saudi Arabia, where homosexuality is punished by death. He’s scared for his life because the data leak can reveal who he is, what is his sexual orientation, and where he lives. I’m sure that Ashley Madison’s developers didn’t though they may compromise somebody’s life when they wrote their codebase. But, it is. So, even if security isn’t a simple thing, it’s time to stop to be scared, and to protect.